Stuart S. Janney's Fair Point made big strides down the stretch to win Saturday's G3 Senator Ken Maddy Stakes at Santa Anita Park, drawing away late to win by 1 1/4 lengths. Ridden by Jose Ortiz, the 4-year-old daughter of Smart Strike covered the approximately 6 1/2 furlongs of the downhill turf course in 1:11.75 over the firm going, earning her first graded stakes victory for trainer Shug McGaughey. Lady Shipman and Fair Point were both very sharp out of the gates, but making her second start over the downhill turf, Lady Shipman accelerated a bit faster to leading the field through the right-hand bend. Juno strode up alongside her to take over the lead, drawing out a one-length advantage to mark the first quarter mile in :21.20. Lady Shipman was content to track in second, with Miss Katie Mae, Acapulco and Snow Cloud not far behind. Fair Point was relegated to the center of the pack, but Ortiz moved her over to the inside rail to save all the ground through the turn. Rolling through the turn toward the stretch, Lady Shipman began moving for the lead of her own accord, taking command after crossing over the dirt portion of the course to straighten away in the stretch. Lady Shipman drew out to nearly a two-length advantage with three-eighths to run, but Fair Point, angled out in the late stages of the turn, was making a strong bid from the center of the course. Nearing the sixteenth pole, Fair Point easily rolled past the leader, drawing away to win by 1 1/4 lengths on the wire. Miss Double d'Oro ran on to finish second, with Most Beautiful out-finishing Lady Shipman in third. Bred in Kentucky by WinStar Farm, M R Capital, and Sam-Son Farm, Fair Point was a $310,000 Keeneland September yearling sale purchase. She won the listed Smart N Fancy Stakes at Saratoga earlier this year, then finished second in her first try in graded company in Keeneland's Buffalo Trace Franklin County. Overall, Fair Point boasts a record of five wins, seven seconds from 14 starts, with earnings of nearly $390,000. 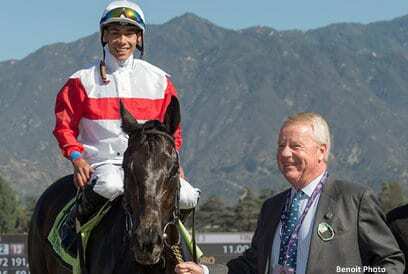 This entry was posted in Racing and tagged fair point, jose ortiz, santa anita, Senator Ken Maddy Stakes, shug mcgaughey, smart strike, stuart janney by Paulick Report Staff. Bookmark the permalink.